If you’re currently studying high school or university, love technology and is in Sydney on the 22rd of August, then you just have to come to TechEd Student Day! Entry is free. During the day, you’ll be attending sessions that will be crucial to an IT career. Explore the graduate employment opportunities with Stuart Packham and Michael Page. Discover career opportunities at Microsoft and learn the tips of tricks of how large corporations recruit the best people from Fiona Hathaway. Get your questioned answered in a Q&A sessions. Followed by a break, then it’s straight into the demos of Windows Vista and Office 2007. After lunch, learn about the Microsoft digital lifestyle presented by Brad Pidgeon and Paul Randle. Philip Cronin will also talk about Building a future on knowledge and Intel. Then followed by another break, and then you’ll have the opportunity to experiment on Microsoft Expression, the interactive development tool with Dave Glover. All that plus opportunities to win some great prizes such as an Intel laptop, XBOX360 and a smartphone. Just for attending, each person will also receive freebies including an Atomic magazine, a Visual Studio Express CD, jobs guide and Microsoft Certificate vouchers. You’ll also have a chance to network with key community and technical leaders in and around Microsoft. 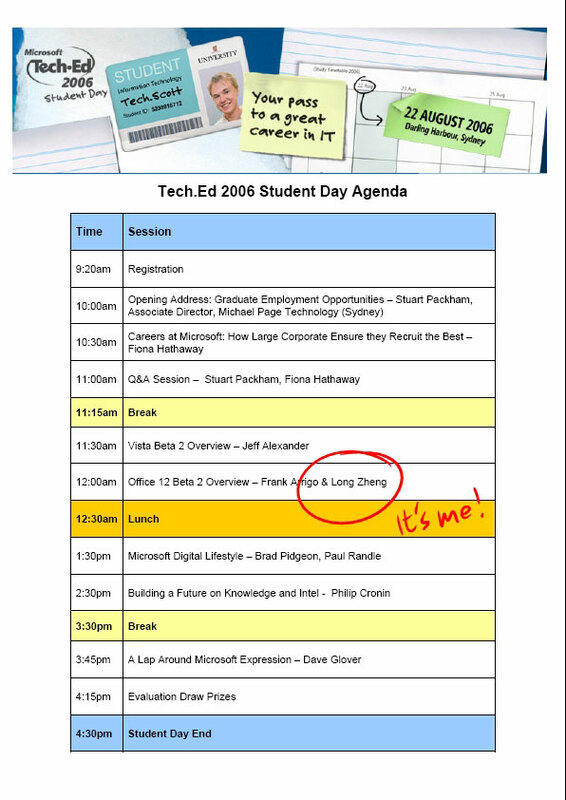 Register today for TechEd 2006 Student Day! And you might also see me. If I’m in the neighbourhood I’d definitely swing by. I fear, however, I’ll be at the other end of the world, as usual. Good luck though!